At HeatinGlobal the UKs number one church heating specialist we can advise and install all the right equipment needed to heat your church. Not only is it important to get the right amount of heat into your church but its also just as important to get the right look. Churches take special planning and equipment when it comes to heating them so only the best of equipment is used. Cast iron radiators can be re-used and is often the best way forward as these retain there heat very well. Removing the existing church radiators and having them internally cleaned and powder coated can leave them just as new as when they was first installed by the Victorians. In cases were a replacement radiator is needed only the best match and type is used to ensure the church looks an feels right. Cast iron radiators can be a heavy and sometimes a 4 man job so be carful if your thinking of removing one yourself. Leaking joints doesn’t always mean the church radiators need to be replaced. Any leaking joints may just need new fittings and many of projects we have visited have been given bad advise in the past about replacing all the church radiators, So stop and seek the right advise before making any decision. A lot of churches wasn’t always heated by radiators but large cast iron heating pipes that either run around the church walls or in the trench below. Cast is a very brittle material and once weeps and leaks start to appear then serious consideration should be taken to start replacing the system. Depending on the grade of the church or the overall feeling of the church council removing pews to install radiators isn’t an option. This then means to correctly heat the church with the right balance and equipment. 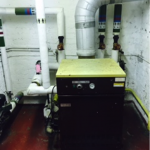 At HeatinGlobal we have sourced the best equipment around to ensure the church is heated correctly and efficiently. By reducing the volume of water this allows the church to warm quickly and adding on the fins to give a better convection of heat. Replacing your old cast pipes around the church walls or in the trench should be replaced with correctly sized coil heating. Many old trench heating systems was un-insulated so once all the old pipes have been removed its important to insulate the ground first. Heating coils are also well used on the church balcony area to give a comfortable heat in this area and prevent cold spotting in the nave of the church caused by cold air falling. Choosing the right amount of fins on your church heating coils can have all the difference on the heat output. Over time many of the cast floor grills become damaged and broken and even replaced by bits of wood or random plates of metal. Finding new church grills can be difficult, Well panic over as these can be replaced either standard or powder coated with any RAL colour chart number you desire. 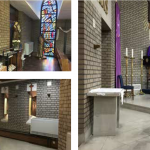 Whether up grading your heating system or just fed up of those ugly patches in your church floor grills replacements can be found to suit your church. Its important to not remove your current grills until your new ones have arrived as trenches have been known to close inwards by 10mm due to ground pressure. Once your new church grills arrive its best to replace each section at a time. 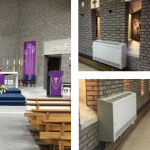 Looking for a special made radiator or section of pipe for your church well just a simple church visit and this can all be custom made to measure for you. As many old church heating systems parts are hard to come by so pre-made special order equipment will be needed whether for a church system repair or up grade section.